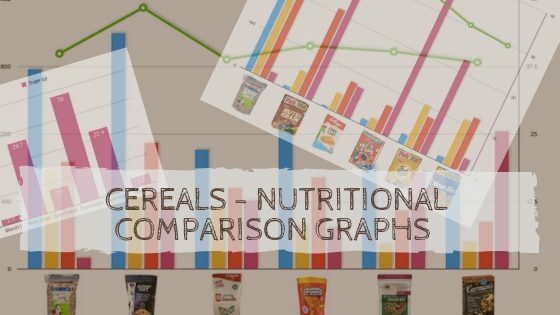 Here’s a nice visual nutritional comparison of some of Australia’s favourite cereals, often consumed by kids & even some adults who haven’t grown out of the cereal habit! 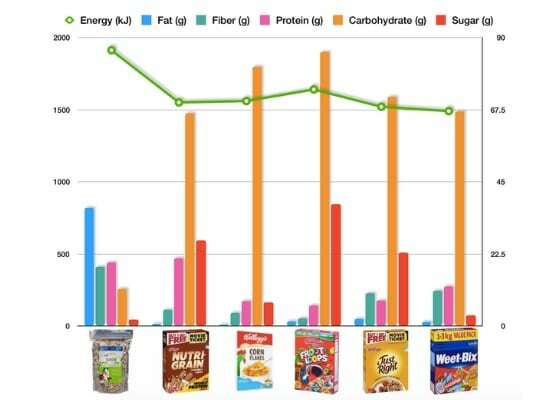 These graphs pretty much speak for themselves, you can see the massive differences in protein, carbohydrates, sugar, fats & fibre – even though the total energy (kilojoules or calories) may be similar to Blend11. Do High-Calorie Foods Make You Fat? I roll my eyes (internally) when overweight ladies (yes, it’s usually ladies in their late 50’s & into their 70’s) quickly look at the Blend11 calories & tell me ‘oh this has way too many calories for me’). It STILL happens. For the 2000th time ladies – eating fat is not what makes you become fat! It will just mean that what you are eating has a lot of energy & a high-calorie count (fat has more calories per gram than carbs & protein). Obesity / weight loss is never as simple as ‘calories in & calories out’. The type of calories are super important as the way your body deals with them is very different! So if you eat the same number of kJ’s / calories worth of rice (mostly carbs, minimal fat) or nuts (loads of fat, minimal carbs), the metabolic result will be completely different, even though calories eaten will be the same. It’s the same when you compare the body’s reaction to a serve of cereal vs Blend11 for breakfast. Cereal = you’ll feel satisfied initially because the bowl is quite big, but the carbs will very quickly be converted into blood sugar, which will trigger an insulin spike & then a drop not too long afterwards, making you hungry again. You’ll go looking for that morning tea muffin or perhaps a second cup of coffee for the day. Blend11 = you might look at the relatively small pile of seeds thinking ‘I’ll need more than this to feel full’, but as you eat you’ll quickly realise a small amount goes a long way & is very satiating. Your body will be busy breaking down all the fat, fibre & protein for much longer & at a much more steady rate, meaning there is no blood sugar spike, & no insulin dump & consequent blood sugar dip. So you probably won’t be reaching for that second coffee or craving that muffin or sandwich at morning tea. When people tell me that Blend11 is too expensive, I will often concede that ‘yes, per kg Blend11 costs way more than the cereals they currently buy. But this is one situation where you literally do get what you pay for. Box of cereal = low cost to purchase, minimal benefit from eating it. Blend11 = high cost to purchase, huge benefit from eating it. It comes down to what you value more – long term health or short term wealth! Ask any wealthy person with a ‘lifestyle’ disease’ & they’ll soon tell you what’s more important! And a poor single parent with healthy kids is much happier than a wealthy parent with sick kids. You just have to prioritise where your $$ go. It’s a good idea to put food at the front of the line, especially if you are feeding kids. As always love to answer any questions! 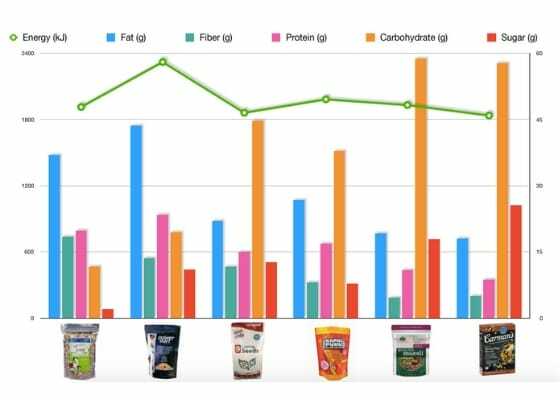 **All data presented here has been taken from a leading supermarket website or taken from product websites / packs. The research has been put together by a marketing student intern for no fee. This entry was posted in Healthy diet, Product info and tagged blend11, breakfast, gluten free, kids, naturopath, organic, prebiotic.